In the early days of this blog, I would regularly write a short note on Fridays focusing on one agricultural event that dominated the news wires in a particular week. I am now reviving that practice. There were a number of important events across Southern Africa’s agricultural sector, ranging from beef trade matters, crop production outlook, and agricultural logistics matters, amongst other factors. But, one agricultural story that dominated the headlines globally this week was avocados, due politics. Last week, the US president, Donald Trump, threatened to close the U.S.-Mexico border unless Mexico stops all Central American migration into the U.S.
Now, the thing is, nearly half of all imported U.S. vegetables and 40% of imported fruit are grown in Mexico. In terms of the U.S. most imported fruits by value – avocado accounted for 19% in 2017, according to data from Trade Map. Trailing behind avocados, are bananas, fresh grapes, raspberries, and pineapples, amongst other fruits. This partly explains why Mexican avocado prices increased by more than a third at the beginning of this week as Trump’s intentions raised concerns that the major avocado supply to the US could be halted,, thus leading to a number of news outlets covering this story. 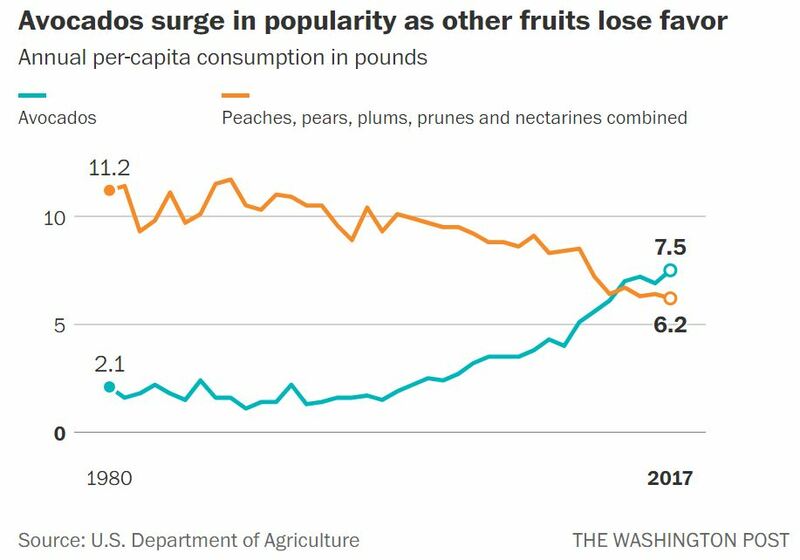 After all, this is an important fruit to some Americans as illustrated by its growth in popularity over time in the U.S.
Anyways – I will pick up on this story, and what all this means for Mexican farmers sometime next week. Suffice to say that we are living in interesting times when it comes to global trade. Let me sign off by focusing on our home soil. The avocado was in the news here in South Africa as well, but for reasons not linked to the developments in the U.S. The recently released preliminary production estimates from industry suggest that South Africa’s 2018/19 avocado harvest could be 30% lower from last season’s bumper harvest. I emphasize – preliminary – because this number could be revised up in the coming months, as it was the case last season, and the other real factor is that we have witnessed an expansion in avocado plantings in recent years. To provide context, South Africa produces on average about 90 000 tonnes of avocados a year. This has grown significantly from levels of just under 45 042 tonnes in 1994. The key driver behind this has largely been an expansion in area planted, which in turn, was supported by an uptick in both domestic and global demand. The South African avocado industry is export-oriented. The country typically exports roughly two-thirds of its avocado production. In 2017, South Africa’s avocado exports declined by 25% from the previous year to 43 492 tonnes, partly on the back of a reduction in output, following the drought period. The leading buyers last year included the Netherlands with a share of 69%, followed by the United Kingdom with a share of 22%, Spain at 4%, and the rest went to markets such as Namibia, Russia and Botswana amongst others.